We’ve been seeing a lot in the news about the shortage of welders, and a kind of PR campaign to encourage women in the welding industry. You know here at CarmenElectrode.com and Arc-Zone.com we’ve been dedicated to supporting women welders since the inception of this blog over six years ago. We put together a playlist of some amazing women working in metal, starting with a great overview of the history of steel interview. Did you know that women worked in the welding industry in the early 1900s! Some women may be intimidated by entering a field so dominated by men (the American Welding Society estimates that only 5% of welders are women), so we have some Tips for Women in the welding industry. And if you’re looking for some inspiration, check out our interviews with women working in the industry today– metal artists, welding instructors, structural steel welders, union pipefitters, and shop fabricators. 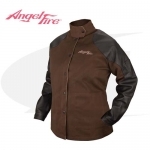 And did you know Arc-Zone.com was one of the first companies to carry the AngelFire line of welding gear for women? So if you, or any female fabricators you know, would like to be featured as a New Rosie, let us know. And if you need some top of the line welding accessories (including that snazzy jacket above), give us a call at Arc-Zone.com (800-944-2243 toll free US or 760-931-1500 worldwide). Our customer care team will make sure you get what you need to get your welding job done! This entry was posted in Original Rosies on March 12, 2013 by Carmen. I have been welding for 8 years and was a FCAW welding instructor at CSN for almost 2 years. I retired from a utility company that I worked at for 19 years. I married a military man and have relocated twice in two years landing in northern California. I’m currently working on metal art and getting ready to build some custom metal furniture. I love metal work, it’s my passion in life. I also have a success story in Larry Jeffus 7th edition Welding Principals and Applications, p 53. It would be an honor to be mentioned in the same sentence as Rosie. Thanks for your time.